The boats will start at the Scheepvaart museum at the eastern part of the city center moving towards the Amstel river. 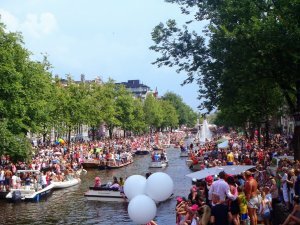 The floats will continue from there taking the Prinsengracht towards the Westerdok. The Canal Parade starts around 12.30 pm and will take all afternoon. Enjoy the parade from one of the (busy) bridges or rom the canal quays. After the parade, bisit one of the street parties to party on. It will be extremely busy during the parade, both on and off the water. However, the route along the canals is several kilometers long, so there are plenty of excellent viewing spots. The best photo opportunities are on sides of the bridges, but those spots are taken usually hours before the parade starts. Keep in mind that the first boats will arrive on the beginning of the Prinsengracht about an hour after the official start. The street parties after the Canal Parade on start at around 16:00. Spectators of the parade often go to Amstelveld (which is direct next to the route), the large main stage on Dam square (en route towards to Central Station) and Rembrandtplein. These are large locations so you can easily bring a family or a group of friends. See our agenda for all other events and parties. The best way is to arrive by public transport. Travel by train to Amsterdam Central Station and walk from there, or even better take a train to Amsterdam Zuid and from there the new metro line to Vijzelgracht. You will arrive in the middle of the parade! You can apply to participate on the Canal Parade from February via the website of the organization. In March there will be a draw to select 80 boats that can participate.Only those 80 selected boats can sail in the parade. Other boats (less than 10 meter) which are not in the parade can lie ashore of the canal, if you get there early before the organization will close down the route early in the morning. No music is allowed on boats lying ashore. We get many questions about joining a boat on the Canal Parade float. 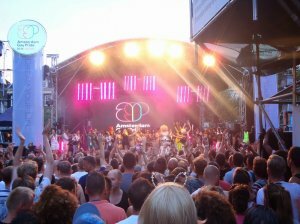 Most boats are organised by organisations and LGBT organisations of large companies. They usually invite only their empoyees, friends and relations.